There are many varieties of kitchen faucets and our Sierra Remodeling Design Team will assist you in your search for just the right product. We offer three product lines of kitchen faucets from Delta, Kohler and Moen. Your faucet should be a higher quality fixture that can withstand the hard, mineralized waters in Sierra Vista and Southeastern Arizona. The Delta DIAMOND Seal technology is especially enticing since this design reduces leak points and lasts twice as long as the industry standard — ensuring leak-free operation for the life of the faucet. Other recent technologies have made kitchen faucet shopping a whole new experience. Are you ready to get your kitchen remodel on? Call us at (520) 459-3164 and, visit our showroom floor for assistance with remodeling your kitchen. We are located at 1840 S. Highway 92 in Sierra Vista, Arizona! I just wanted to take a few minutes to tell you about your employee Scott who came to my home this week to look at a window I have been having problems with. For several months, I have been getting moisture between the double pane (very large) window in my master bath. I called several places and they sent someone out to give me an estimate on replacing the whole window. I was telling my friend, Mrs. Joy B. (we live in St. David) about the problem and she said that she received estimates on work that needed to be done at her home and that Scott was the person she had been dealing with and she thought I should give your company a call. Scott came out, looked at the window and said, “You don’t need a whole new window, you just need new glass and that certainly would not come close to the estimates I had gotten that were very high dollar. He gave me the name of a glass company to call (they are stopping by today to take measurements) and the price will not be expensive. I have lived in St. David for eight years, and I have come in contact with the worst of the worst in construction. As a retired prison warden from Nevada some of the contractors in this area should be behind bars! It has been so refreshing to finally meet an “honest” person. 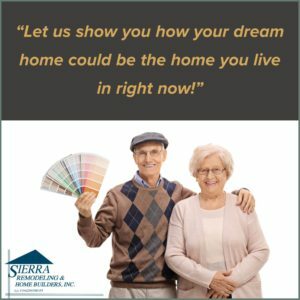 Scott is valuable asset and representative for Sierra Remodeling. I don’t know if you have a way to recognize your employees, but if you do, please make sure he is included.